Small carpets, like this, with a single arch are often referred to as 'prayer carpets' because mats are often used to define a person's space during Muslim prayer rituals. The arch is usually taken to represent the mihrab or decorative panel in the wall of a mosque which indicates the direction of Mecca. 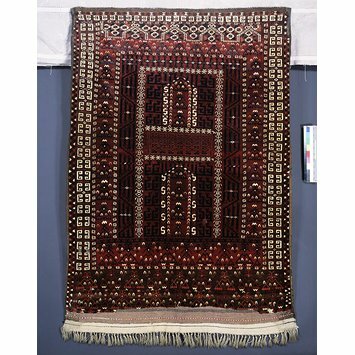 The important thing to note about this carpet, which was probably woven by the Saryk tribal group, is that much of the lower end has been rewoven and patched. The white pile is cotton; the rest is wool. Cotton gives a purer white than wool, which tends to be creamy in colour. END FINISH: Lower: largely missing with added repair. Evidence of what may be original plain weave in lower right hand corner, max. 42" (11.5 cms) in length. This is made up of a band of plain weave with white weft below and band of plain weave with brown weft. Both bands contain a line of weft twining, the lower in red and blue, the upper in white and pink. The warp threads have been knotted to form a fringe. There are 4 shoots of orange weft immediately before the pile begins. Upper: cut but there remains 1" (3 cms) of plain weave with warp threads grouped in threes and with thick brown woollen weft (perhaps this is a later repair). DESIGN: Field: dark red ground divided into 4 parts by a horizontal panel and 2 upright arch-shaped panels. The horizontal panel has 2 bands of crossed trefoils and each upright has a row of stylized drooping plants and is outlined by white S-motifs. The field has 4 rows of stylized tendrils with a row of white X-motifs with yellow bars at the top and above and below the central panel. Main border: Dark red ground with drooping plants outlined in dark blue and dark green. Inner border: Not at the bottom. Dark red ground with angular meander enclosing dark blue vertical bars. Vertical bars only at the top. Innermost border: Not at the bottom. Dark red ground with stylised tulip heads in predominantly white and yellow. Outer border: Not at the bottom. Dark brown ground with a row of red crosses within a pair of white brackets, each cross separated by a chequered bar. Elem: dark brown ground with 2 bands of stylized plants with pendent blossoms in dark red and orange outline with pink decoration. Upper panel: below the border with bracketted crosses, there is a band of 42 linked and horned white arches. Within are two, and between are 4, dark red and dark blue quartered small rectangles inside a white diamond. cf: A A Bogolynbov (1909) ill. 4. ident. of an "Antique Pende Engsi.. this is old Nomazlik.."
JMA Thompson (editor, 1973) adds: "I wish to underline that it was bought in a Saryk village in the Pende oasis, that it was used as an Engsi.. this is clearly Saryk work.."
Ulrich Schurmann (1969) (Plate 36) ident. 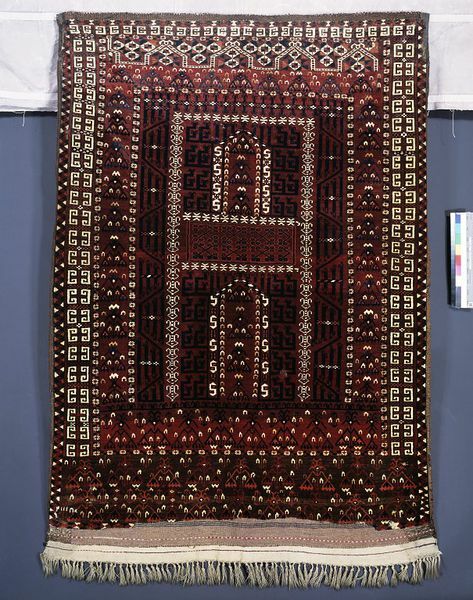 as a "Kizil Ayak, Namazlik (prayer rug) or Engsi, early 19th century." S.
Elena Tzareva (1984) (Plate 18) ident. as a "Saryk ensi, first half of 19th century". S.
J. Clinton Bond, Quetta, Beluchistan. Purchased for £18.